Bungalow/Craftsman. 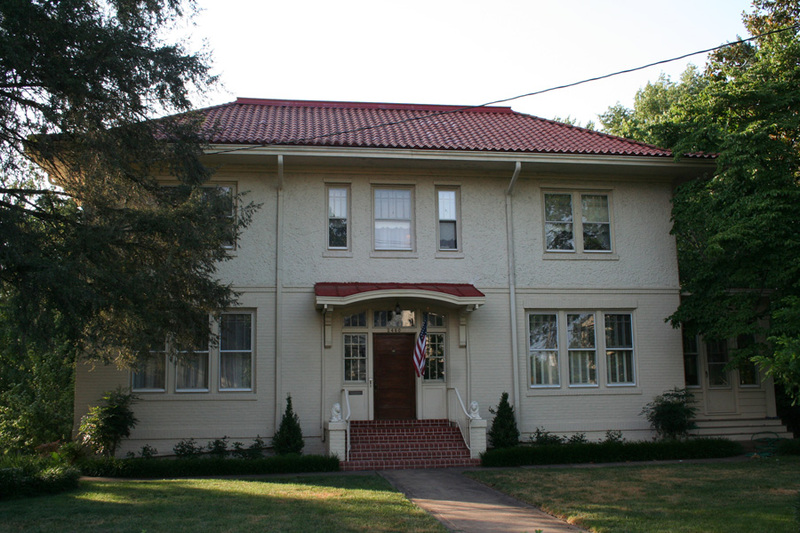 2-story, 3-bay hip-roofed, stuccoed brick ho use with Spanish tile roof and wide overhanging eaves. Windows are tripartite, some with 8/1 sash. Small bracketed hood is over central door. Enclosed porch is on the east side. This building is currently The Residence bed and Breakfast. Interview with Joanne & George Caylor on June 9, 2010: Joanne and George Caylor moved to Lynchburg from Germany in 1987 after reading an article placing Lynchburg as one of the safest cities in the 1980s. They liked the area and eventually settled on buying the home on Rivermont. The house was built in 1915 and used by Randolph-Macon Woman’s College as a home for their presidents starting with William Webb, until 1983 when they sold it. The former president’s house has hosted celebrities such as Pearl S. Buck and Elizabeth Taylor, as well as hosting President Gerald Ford for breakfast. In 1998 the house was turned into The Residence Bed & Breakfast.